Drove to a little town called High Level this past weekend. It's in Alberta. I've never been. I like crossing borders. Makes me feel as though I'm doing something totally different even though there's no real line separating one province from another. But according to everyone, there is a difference. Suddenly I'm meeting up with cars that have different license plates than I do, little red ones. Mine is in the shape of a polar bear. Not by choice, just what they happen to issue way up here. I've had a great week so far. Things seem to be falling into place. I'm back in the cockpit of a car, with all of my music at my fingertips, or on shiny little discs that I have a fondness for making. And now, I'm sitting in my bedroom listening to and searching for little covers of great songs that I adore. Live cuts, rare releases. It's like how I imagine crack cocaine to be. Lou Reed is in the background. Bailey is in the other room, sometimes he gets stuck on the other side of the house not able to see how to make it back to wherever I am. I check my mailbox every day. I make coffee with my little french press, fresh ground beans (still working on the art of grinding) and slip into my makeup and clean clothes every crisp frosty morning. I feel like I'm living a real life again. One filled with the minutia I've missed from my London days. But I look at the clock now and see it's time for the evening movie. And I just noticed that I have about 4 different versions of Sweet Jane. Also, for some reason...I have always felt Lou Reed could be a genius but he is a little...creepy. Found a place to live. A trailer/house off the highway near the river just outside of town. Quiet, remote and surrounded by trees. A couple of bedrooms, a woodstove and an enclosed sun porch. Just what the doctor ordered. Although, truth be told, the kitchen is a scary eyesore. I might slap some paint on the cupboards just to brighten it up. It is totally 1960's trailer trash kitchen except for the appliances. But I can deal. Movers dropped off *most* of my stuff yesterday, my television and a couple of bags missing (but apparently found and will be delivered later this week). Then this morning, I checked out of the hotel, dropped the rest of my things (luggage, etc) and Bailey off at the new house before hiking it back into town in time for work. I have to tell you I'm already exhausted. I don't have a car yet, the cab fare is about 30 dollars roundtrip, so I'm feeling a bit anxious about that. I still need some basic things for the house but am so tired and frazzled that they will have to wait until I have more time and inclination to get it all done. Work seems good, I really like the people so far. Only39 days until the Ireland trip, then a long summer here in the Northwest Territories. I will try fishing again. As long as I don't have to kill what I catch. I am sure there is something else I forgot to do. Email me, call me, text me. Unfortunately for both Bailey and myself, he is not able to travel on a plane like the above photo any longer. I had to put him in a carrier for our last couple of airplane rides, and while he yelped for awhile he eventually settles down when the plane is in the air. We left Nunavut today. Although I found out about an hour ago that he actually left Nunavut a couple of hours AFTER I did. 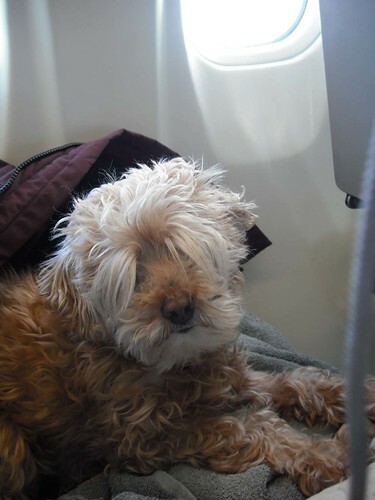 Yes, the airline LOST my dog. Rather, they misplaced him. For awhile. When I arrived in Yellowknife, I checked at the counter to make sure he was doing ok and they couldn't locate him. In fact, there was no record of his ever having been on any flight at all today. So in a very calm manner, I say well he's my dog, here's his receipt of travel. Find. Him. Now. Meanwhile, I'm holding up a plane that's going to Hay River because I want to know where the dog is before I get on another flight. Eventually, in my normal good nature (yeah, right...I just didn't know what to do), I said that since he is not actually in that airport (they searched everywhere apparently) we should just get on the plane and while we're in the air, they can do their magic searching thing and find my freaking dog. Or else there was going to be a very strange hell to pay when I got near a phone with my calling card. I would be waking up anyone and everyone who had anything to do with this particular airline. I get to Hay River and was told they had located him, along with all of my luggage on a flight that had arrived shortly after we had taken off. So, an agent is taking him home tonight to look after him and he will be on the first flight in the morning. All is ok. It's all sorted out. but I still feel rather indignant that an airline freaking misplaced a yelping animal in an animal carrier with a tag that said it exactly where it was going. AND, I had taken him right to the counter and dropped him off there. It's not like I made him switch planes on his own or anything. 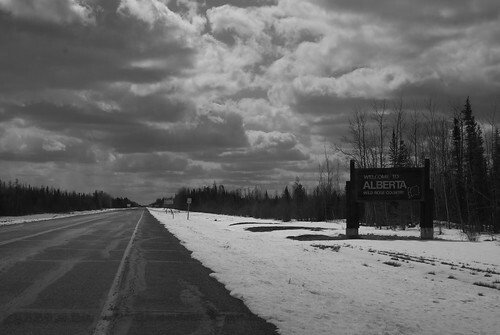 I cried on the flight to Hay River. Which disturbed me. I'm jet lagged, I can't tell what time it is because I'm in another time zone. I'm hungry, etc, etc. The flight attendant gave me wine. That helped. I can't believe I cried in public. Anyway. It's sorted. Bailey will be reunited with me tomorrow. Ugh, this trip is so far...not turning out so well. It's almost time to jet. I've got 99.9% of my things boxed up and ready to go. I've stopped buying food. I've decided on the sets of dvds to keep in my luggage for Easter Weekend Marathon. My shoes, my curtains and my lovely photos are stashed away in sealed cardboard boxes, waiting for the time to be unpacked in a new space. It's exciting. Anti-climatic for sure (I always find it is that way). But maybe in my mind, I've been gone from here for a long time. It's just time for my body to catch up with my head. Always seems that is the case. I've been looking at airfare for Cuba, thinking of tacking a week on to my Ireland trip so I can roll and smoke cigars with Leesa and Caleb. Not sure that will happen, but it's kind of fun to see what something like that would cost. Tomorrow is my last full day in Nunavut. I will spend part of Wednesday climbing in and out of airplanes but I won't be spending a whole day in Nunavut. On to a new province/territory. Time to shake off some of this old, and paw my hands through the new. That is the part I'm most excited for. The new. 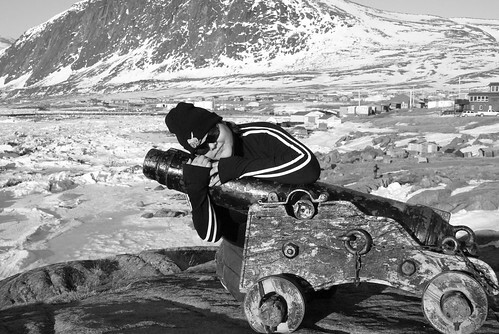 So I leave my last entry in Nunavut, with a photo taken of me last year in Pangnirtung. Fun times in a dry community...who would have thought? I've definitely had an adventure here. It wasn't the swash-buckling, crazy marathon adventures some can claim. I never did get to see a polar bear, or sit in an igloo but I met some fantastic people and bonded with a community in such a way that it almost pains me to leave now. Countless airplane rides, frequent flyer miles and a grinning face no matter which way I turn. Yeah. It's been good, but I'm really ready for something else. I still have my bedroom (big huge scary mess) and the kitchen to pack up. In fairness, I am not altogether sure what to leave unpacked since I'm not leaving until Wednesday. Might need stuff before then. Like blankets. So, in a few minutes when I'm done my 3rd cup of coffee and 10th cigarette, I'll head upstairs to start sorting out the mess that I need to bring along with me to Hay River, Northwest Territories. A tiny town at the mouth of McKenzie River. It reminds me of bush planes, and voyegeurs portaging (spelling, anyone?) through thick damp, mucky forests in the 1700's and the first taste of diversity in Canada. Bad history that was probably not so great in the present, either. today is beautiful. Yesterday was, as well. I could have sat in a lawnchair in my winter parka outside for hours just soaking up the sun. well, on my face, anyway. Cold enough to need the parka, but not so cold that I need to cover every inch of my skin. I no longer need my longjohns when walking to the store. So many things I could be shedding right now. Clothes, dishes, silverware, books. All in a little trail behind me. It's just stuff. I no longer have a favourite bowl, or drinking glass. I stick to water bottles and disposable forks. It just seems nicer. Lighter. Easier to make my escape.